Cin's sister is gone. Kidnapped. Now her boss has hooked her up with a friend of his who says he can help find her. He’s so cold and distant that she has trouble imagining he cares about anything. They have to find her sister before she has an episode, and her strange abilities become known to her captors. Thad knew he shouldn’t have answered his phone on his day off. Now, he’s stuck helping this woman find her sister, and all he can think about is trying to keep his hands off her. Besides, if he touches her then it might trigger one of his visions and the last thing he needs to do is explain magic and visions to a mortal. 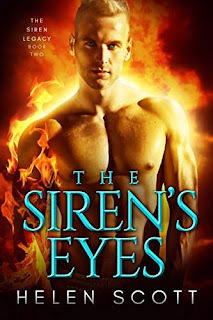 Powerful and thrilling, The Siren’s Eyes, is a tale that will fascinate lovers of paranormal romance! Don't miss the latest installment of the Siren Legacy series by Helen Scott!